The Swedish-born American actress, Mercedes Mason, who plays "Ofelia Salazar" in the already hit series "The Walking Dead Fear" issued by the AMC, celebrated Christmas Eve in the city considered forced the World, "Cusco" to be filled with positive energy during the holidays this year. As confirmed on his twitter where I post a photo with the description: "Hello Cusco ... soon we will climb Machu Picchu. The lifelong dream will be fulfilled !, I am so happy. 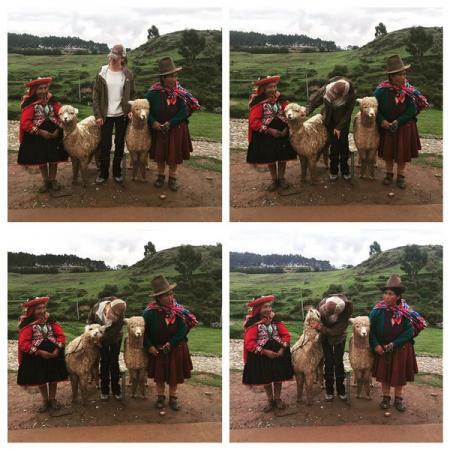 "Actress had arrived on 23 of the present to the city of Cusco, where he spent the night in a hotel still unknown to the 24th take a tour the Sacred Valley, then on the wall also published photos where is trying to approach an alpaca with the note: "It started with a look. Then a tickle. The alpaca and I are now in love "; although still unknown what his itinerary for the following days, it is believed that possibly 25 came to the Inca citadel of Machu Picchu. WEF: Peru ran seven places in ranking of tourist competitiveness. The news network "CNN" chooses Peru as "its Wonder of the month"